From BPMN 1.2 to BPMN 2.0, one of the significant improvement is the BPMN 2.0 defines an extensibility mechanism for both process model extensions and graphical extensions. Such extensions can be used by modelers and modeling tools to add non-standard elements or "artefacts" to satisfy a specific need and still have valid BPMN Core. Although BPMN 2.0 provides such extensibility mechanism, it is not commonly implemented on modeling tools. Figure 1 is an example of a BPMN process diagram - Pizza Collaboration process. In the diagram, message flow element and message element are used to represent not only informational objects but also physical entities such as pizza, money and receipt. Although this is logical useful and acceptable at Descriptive process model level, it often cause confusion to business audience. How often you heard comment like this in a workshop, "I can understand the pizza order as a message in an envelop shape but why is the pizza shaped as an envelop?" However, using extended artefacts in the same process diagram makes the diagram more user-friendly and more intuititve to business audience. The process diagram below used a collection of extended artefacts to represent those entities that are not message or information in nature. Two methods are used to associate the extended artefacts with activities in the diagram above. The "pizza" box is link with two associations - one with "Delivery pizza" task and the other with "Receive pizza" task. Using this method, no direction and flow are shown. However the payment and receipt artefacts are link with an association each to the message flow. The second method indicates a directional flow of artefact between the participants using the "message flow". The simple association method can also be used to link useful pictorial information on the diagram. In the example, a "colourful boxes" shape is used to represent "materials" for making pizza. Another use of extended artefacts is to provide graphical representation for different kinds of analytic information on the diagram. Hence instead of using text annotation element for all sorts of information such as risks, improvements or performance indicators; each type of analytic informations is represented by a specific shape. In the process diagram below (Figure 3) a red octagon represents risk; a spanner represents improvement; and an odometer represent performance indicator. The process diagram in Figure 3 is particularly useful for communicating analytic information of a business process to business users. A reader can easily identify the key messages provided in the diagram as each type of information is represented by a specific shape. Without these extension, the only way to represent these information on the diagram is by adding "text annotation" elements or "data object" element. It is nice to have all these extended artefacts in BPMN 2.0 process diagram but it is strongly suggested to limit the number of types. Provides clear definitions and instruction of how to use them. Ensure that they are applied consistently across projects in the organisation. Warning: As the implementation is tool dependent, using them reduces or even removes the portability of the model between tools. The extension mechanism in BPMN 2.0 provides process modelling tool implementer a way to supplement the shortcoming of the core BPMN elements. <i>Yes, it depends on the tool implementer and not all tool include such extension mechanism.</i> With the extension implemented, a BPMN process model could be made compatible (in graphic representation) with other process modelling notation such as SIPOC, VAC and EPC. I will leave that to my next article - comparing process model 'drawn' in different types of process notation. Yaoqiang BPMN Editor. 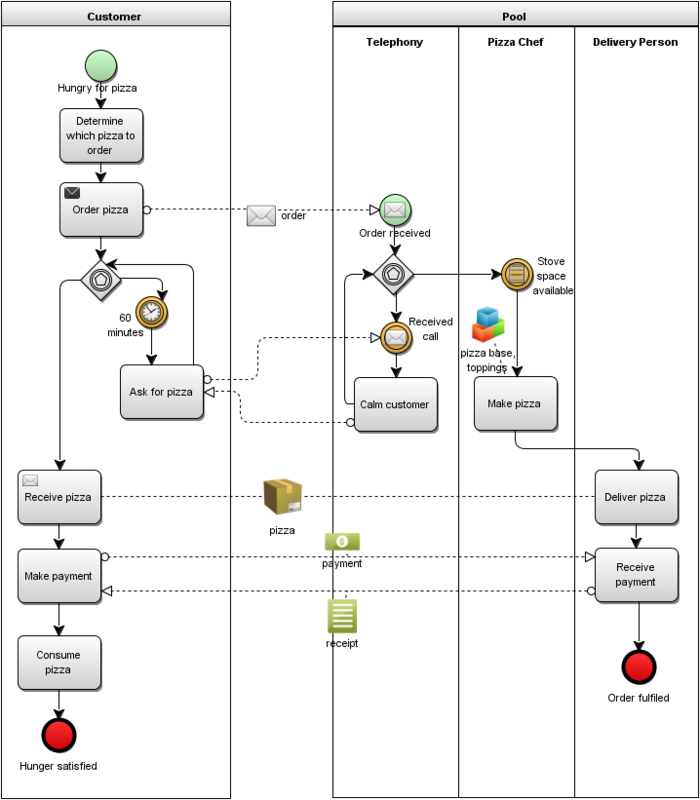 The above BPMN process diagrams and models are prepared using a special edition of the Yaoqiang BPMN Editor with extension mechanism implemented. The current version on the sourceforge.net may not have the extension mechanism implemented. Check on the release information.